Time will show whether a broad dialogue is possible between the US and Russia about Syria’s political future after the ISIS defeat and how to bring the Syrians themselves to real national reconciliation based on reasonable compromises. The “no winners – no losers” formula is most consistent with Arab historical traditions and mentality. On November 11, during the summit of the APEC member-states in Danang, a kind of “expected surprise” was announced. The presidents of the Russian Federation and the United States agreed on a joint statement on Syria. The internal conflict in that country, torn apart by civil war, terrorism and external interference, has always remained a hot topic on the international agenda and especially in the Russian-American relations. Russian and American interests simultaneously coincide and differ to the greatest extent. At the same time, there is mutual understanding that without finding points of contact between Russia and the United States it is impossible to unleash the conflict node with many players involved as spoilers. In many ways, thanks to their diplomatic efforts, the UN Security Council developed and adopted a large stratum of legal international instruments, which form a solid foundation for the future settlement. Under the Obama administration, there were moments when both sides came very close to reach agreements, but stable coordination or at least work on parallel courses was never achieved. With all the setbacks, reciprocal claims and disagreements, sometimes rather explosive, Russia and the US managed to preserve the channels of communication. The Russian-American statement at the highest level adopted in Danang is of particular importance for a number of reasons. It is difficult to predict which way it will proceed, but a declaration of this kind has a chance of becoming the starting point for building the necessary minimum of concerted steps for Syria, especially in the new conditions. Of course, if Moscow and Washington are able to temper the ambitions generated by successes in the fight against ISIS and, at least in the Syrian case, to rise above the global problems that separate them, in order to help the long-suffering Syrian people break the vicious cycle of violence and humanitarian catastrophe. First of all, the joint statement of the presidents of Russia and the United States is the first joint political action after the arrival of the new US administration, undertaken despite the generally bleak background of bilateral relations. A year after his election victory, President Trump's Middle East strategy (as well as his foreign policy as a whole) is still vague, according to the opinion of the majority of American experts, and confused decisions are often taken for the sake of tactical reasons or as a reaction to those or other wrong steps. The presidents came to common understanding on a number of fundamental issues, based on a realistic assessment of the changed military and political situation in Syria. In recent months, as a result of military actions against ISIS in the east of Syria, the forces supported by Russia and the United States were so close to each other that it was necessary to activate the communication channel between the military of both countries in order to reduce the risks of unintentional dangerous incidents. The presidents agreed to continue these efforts through their militaries, including work with their partners fighting against ISIS. Whether these efforts go beyond the military area is not yet clear, although Russia and the United States, if political decisions are taken, could establish cooperation in the formation of local self-government in the areas liberated from ISIS, on the basis of national reconciliation. This would facilitate the provision of humanitarian assistance, the return of refugees and economic reconstruction in general. It is important to confirm the conclusion that the conflict in Syria does not have a military solution, and a final political settlement must be found within the framework of the Geneva process in accordance with the UN Security Council resolution 2254 in its entirety. Which means implementation of constitutional reform and free elections under the auspices of the United Nations while preserving the sovereignty, independence, unity, territorial integrity and secular nature of the state. The presidents called all the Syrian parties to take an active part in the Geneva political process and support efforts aimed to guarantee its success. Of course, these are only the most general principles of reform, which never caused serious discrepancies before. It is no exaggeration to say that the UN Security Council resolution contains a kind of "roadmap" for the transition period. But all the pitfalls lie in its implementation. There is no common interpretation of the key provisions of the resolution between the Syrians themselves, and in the Syrian case there is no higher institution, which was the case with the implementation of the Dayton agreements on the former Yugoslavia. This includes, among other things, practical issues of state building on an inclusive basis, such as agreeing on a sequence of steps determining the order of work on the adoption of a new constitution and the formation of executive bodies in the center and in the regions, ensuring security for the duration of the entire political transition. At the same time, the mere fact that the presidents of Russian and the US considered it possible to focus specifically on the Geneva process can be viewed as a clear message to the opposing Syrian sides and regional players with their maximalist interests that do not always coincide with the global interests of Russia and the United States. Opportunity of such a step is also determined by the fact that the agenda of the intra-Syrian negotiations in Astana under the auspices of Russia, Iran and Turkey as guarantor countries of the regime of cessation of hostilities, began to expand and entered the political field set by the resolutions of the UN Security Council for Geneva with the mediation of its special representative. This caused mixed reactions in the US, in leading European countries and in the Arab world, despite repeated explanations by Russian officials that Astana is called upon to create favorable conditions “on the ground” for the intensification of the Geneva talks. On the one hand, seven rounds of talks in Astana allowed the launch of four de-escalation zones in the central, north-western and southern regions of Syria, significantly reducing the level of violence and creating conditions for the humanitarian aid access. The United States, which initially perceived Astana like any multilateral mechanism where Washington does not play a leading role, with a great deal of skepticism, agreed to send their observer. At the same time, various kinds of speculation arose, that Russia and Iran on the background of military successes are working to "bypass" the basic resolution of the Security Council 2254 and to impose a settlement by force. The triumphant atmosphere in this regard in Damascus only confirmed these fears. 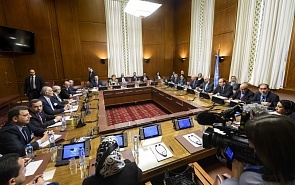 Representatives of the armed opposition at the talks in Astana, for their part, expressed their complaints to the delegation of the Government of Syria about the violation of the ceasefire regime, the failure to implement such confidence-building measures as the release of political prisoners, lifting of the blockade in a number of areas and the provision of unhindered access to humanitarian aid. Finally, the joint Russian-American assessment of the de-escalation zones as a temporary measure in order to create conditions for a final political settlement of the conflict deserves special attention. This looks important in the context of the view widely held in the Middle East that Russia and the United States seem to have come to the conclusion that it is impossible to achieve a sustainable settlement in the foreseeable future and therefore they create the “so-called” de-escalation zones only to freeze the conflict. Time will show whether a broad dialogue is possible between the US and Russia about Syria's political future after the ISIS defeat and how to bring the Syrians themselves to real national reconciliation based on reasonable compromises. The “no winners – no losers” formula is most consistent with Arab historical traditions and mentality. Until recently, the Trump administration considered “eradicating terrorism” in Syria and Iraq its top priority. The American diplomats said confidentially that the US was tired of “state building.” At the same time, the situation in Syria has approached the line when it is necessary to give an answer to the question: what’s next? The practice of recreating the medieval caliphate under the slogans of jihad can be considered obsolete. But with the loss of territorial subjectivity, this very ideology is unlikely to disappear. Especially among the Sunni majority in Syria and the Sunni minority in Iraq which are seeking such reforms in the power structures that would give them appropriate political representation. Russia, as President Vladimir Putin has repeatedly said, believes that the necessary prerequisites have been created to begin the stage of political settlement in Syria. Partnership with the United States would help advance this process.